Right fielder Jackie Bradley Jr. fires the ball back to the infield after making a nice running catch in the third inning Monday night. There are enough sharp angles and varying dimensions for even a veteran outfielder to get lost down the right-field line of Fenway Park. It’s just 302 feet from home plate to Pesky’s Pole before the wall, with its subtle height changes, juts toward the bullpen and stretches across right field to a distance of 380 feet. And then there is the unforgiving wall in front of the bullpens, which at 5 feet is just low enough to send a fielder tumbling over, as Torii Hunter memorably did in Game 2 of last year’s ALCS while chasing David Ortiz’s grand slam. 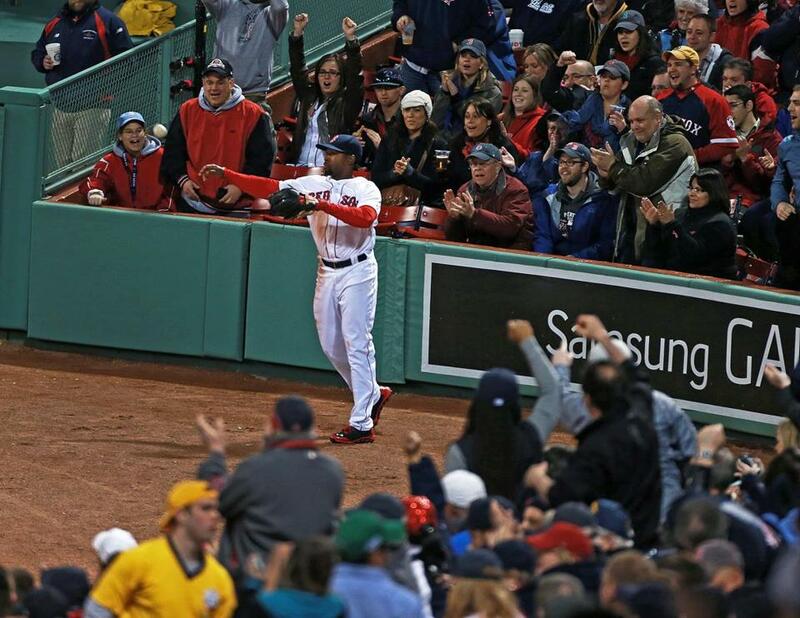 Jackie Bradley Jr. made just his second career start in right field at Fenway Monday night, playing a key role in the Red Sox’ 5-1 win over the Rangers. He had a pair of highlight-reel catches, the first of which was a sliding snag on a Donnie Murphy liner in the second inning. In the third, J.P. Arencibia roped a ball over Bradley’s head, and he covered a great deal of ground to make a basket catch at the warning track. Bradley also had a breakout day at the plate, going 3 for 4 with a pair of RBI singles that gave the Red Sox a 2-1 lead. In the eighth inning, with runners on first and second, Bradley bunted for a base hit and A.J. Pierzynski scored on a throwing error by first baseman Prince Fielder, sparking a three-run frame that sealed the win. Bradley was prepared for a busy night as the Rangers started four lefthanded hitters against John Lackey. But Bradley was focused on staying patient. With right fielder Shane Victorino (hamstring strain) on the 15-day disabled list, manager John Farrell has relied on five players to patrol the outfield this season: Grady Sizemore, Daniel Nava, Mike Carp, Jonny Gomes, and Bradley. Bradley made his Fenway debut in right field Saturday against Milwaukee. In 37 games with the Red Sox last season, Bradley mostly played center and left field, logging just two innings in right. The 23-year-old has spent the majority of his minor league career playing center. During spring training, Bradley played some right field at JetBlue Park, which mimics Fenway’s unique outfield dimensions. Nava, who has started five games in right this season and played 69 games there in 2013, was only half-joking when he said you need two center fielders — one to play right field — at Fenway Park. Boston benefitted from that last year with Jacoby Ellsbury and Victorino, who won his fourth career Gold Glove and first in right field, the first Red Sox player to do so since Dwight Evans won his club-record eighth award in 1985. “If there is someone who is capable, it’s Jackie,” Nava said. “They get probably a little more speed in Jackie as well. Nava had trouble in right in Sunday’s loss to the Brewers when he charged in to make a catch but instead pulled up, with the ball skipping past him. Milwaukee got an extra run out of the error. So what’s the key to handling right field at Fenway? “Just not trying to do too much with it, trying to hurry up and cut [the ball] off,” Bradley said. “I think if you treat it like a double is a double normally down the line, and just try to stop it from getting around more than that. Saturday’s game lasted 11 innings and Bradley did not see any defensive chances in right field. On Monday, Bradley proved he was more than capable than handling the puzzling corner.